My friend, Keith Boyd, has started up a new business! Canvas! I Love Canvas! Its tough, durable, and economic! Being a start up business, I am always glad to help out. So I told him I would write a Blog about his co and my new Bags! 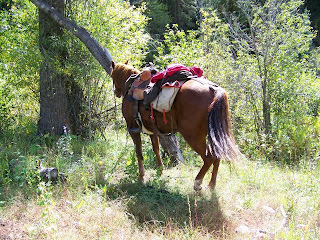 I have had this set of Canvas Saddle Bags since the beginning of time.....you can see them here in several of my blogs tied to the back of my saddle! Here they are on Luke when I rode at Horse Ranch Park over above Crested Butte in 2008. You can barely see them here on Rex over at the Soap Creek area West of Gunnison in '09. But their beginning started a long time ago, I would say probably 30 years, before I got married and had kids even. I mean, these saddle bags have been with me for YEARS and you know, kind of felt like an old friend. The are HUGE, and before digital pictures, well, before I quit the drinkin' and ridin' thing, I could carry a SUITCASE of beer plus ice in them. And did! Plenty of that! Ha ha ha! Got so that at the end of a trail I sounded like a garbage truck comin down the trail....all those empties! 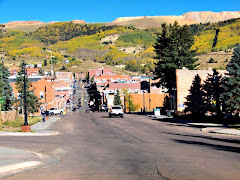 I remember when I first moved to Cripple Creek back in 1990 I had those saddle bags on top of old Smokey, my good QH gelding. Oh he was pretty! Dappled Grey, walked out like none other and go anywhere. We traveled many a mile with those bags tied on back, full of Coors or Keystone Light! Those saddle bags held it all. 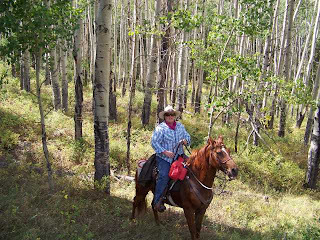 Anyway, I rode old Smokey from Victor to Cripple Creek in front of the Donkey Derby racers when they used to start in Victor and have to ride those onery critters from Victor to Cripple Creek. (Before Political Correctedness got out of hand and a critter was used for what they was built fer...) Anyway, that was fun. Eventually, as with all things, those bags just plumb wore out. I took 'em down to the boot shop and they fixed em up; reinforced the grommets which pulled out and added some extra strength here and there...but it became obvious to me that I was gonna have to replace the old bags. Just wishd I had pics of them before they went. My SVEN saw has sharp edges, and try as I might to protect the bags, they wore a hole in the bottom. Course, everyone knows my propensity for Duck Tape....that worked pretty good....but...then, the grommets pulled out again and well the canvas was just plain rotten anymore. The bags hadda go. I looked and tested and checked and felt up just about every bag I came across at every feed store, horse outlet and saddle shop I could get into......none were quite like my old bags. Bummer! Then, lo and behold, my friend Keith, whom I became friends with by sellin him a cabin, (THAT was an adventure and a 'whole nother blog ) who has also been a canvas guy forEVER 'except he got sidetracked into being a Casino Floor guy when he moved here, got back into the business! YAY sez I! Keith....can you build me a set of saddle bags? And he did! And here they are! So, to make this long story short, follow along as I use these saddle bags for what they are meant to be used for.....'cept I don't pack beer anymore, just groceries and saws and apples and gloves and such. I'll put 'em through the test, for sure, maybe even today, on Skipper as I pony her next to Barbie. and have him build your canvas thing! Teepees, car covers, bags, and more he's got a whole list of stuff they do from Trampolines to tents and more! Tell 'em Carrie told ya to call! Come back and visit here once in awhile, I'll post pics of how these NEW Bags are doin' on the back of a pony, too!